Unless you are an onion connoisseur, you may be surprised to learn that the main difference between pearl and boiling onions has nothing to do with their flavor and little to do with texture. These onions gain their names from their size and use and aren’t a special variety of onion at all. In fact, you can harvest either pearl or boiling onions from the same variety of onion plants. Pearl onions are those delightful little onions you typically see in pickled veggies. While most are pearly white, pearl onions can be yellow or red as well. Pearl onions measure about 1 inch in diameter and are sweet and crisp and come from any variety of onions. These immature onions have not developed the strong flavor of mature onions. Their delicate flavor complements meats and poultry. What Is a Boiling Onion? In the case of the boiling onion, its name refers to its common use and size, not a variety of onion. These onions are often boiled whole in soups or stews or nestled around roasts to add flavor. Like the pearl onion, boiling onions are harvested when they are immature. Boiling onions are slightly larger than pearl onions and average 1 to 1 ½ inches in diameter. Boiling onions are typically white or yellow, but can be red as well. The flavor of both pearl and boiling onions varies depending on the type of onion they are harvested from. As a rule, white onions are slightly sweeter, while yellow and red onions have stronger flavors. Because pearl and boiling onions are both immature, sometimes referred to as baby onions, they lack the sharpness of mature onions. Used primarily for pickling with other baby vegetables, or pickled and served a condiment, pearl onions add visual appeal to the meal. Boiling onions, on the other hand, add delicate flavor to soups or stews and enhance the flavor of meats during roasting. 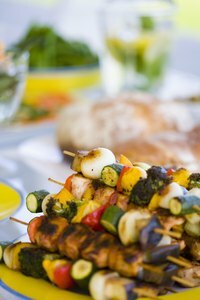 When threaded on skewers with meats, poultry and fresh veggies, boiling onions add flavor while making a sharp color contrast to brighten the appearance of shish kebabs. Many use the term pearl and boiling onion interchangeably. Those in the grocery or sold at produce stands may be labeled as either. Some sellers refer to only small white onions as pearl onions and small yellow onions as boiling onions. The use of the terms pearl and boiling onion may differ between regions of the United States or from seller to seller. Likewise, the terms may be used interchangeably in recipes.